MakMax Umbrellas are available in a range of shapes and sizes, collapsible, portable and modular units, with colour and branding potential and they can be customised to suit each site using our wide range of accessories including heating misting and lighting. 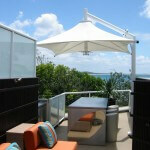 Our umbrellas can be installed to most surfaces including concrete footings and slabs, timber decks and boardwalks. The structures are easy to transport and arrive to site fully preassembled or in component form for easy erection. The Leva (cantilever column, collapsible) range of MakMax Architectural Umbrellas are also available in square, rectangular, truncated square, octagonal and hexagonal canopy shapes with models ranging between 5.8-24.7sqm. 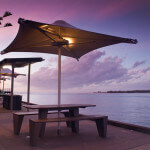 Designed to Vdes 40.5m/s (145.8km/hr) wind rating as standard, the cantilevered pole allows for unimpeded use underneath the umbrella canopy. The Leva canopy is delivered to site preassembled and is easily collapsed when connected to the cantilever pole. The Centra (centre column, collapsible) range of MakMax Architectural Umbrellas are available in square, rectangular, truncated square, octagonal and hexagonal canopy shapes with models ranging between 5.8-24.7sqm. Designed to Vdes 40.5m/s (145.8km/hr) as standard, an optional upgrade to Vdes 50.3m/s (181km/hr) is available on all Centra models. All Centra models include stainless steel cables and fittings, UV stabilized membrane, are delivered to site preassembled and are fully collapsible. The Porta (centre column, collapsible and portable) range of MakMax Architectural Umbrellas are square shape and available in 3.8 and 8.2sqm sizes. 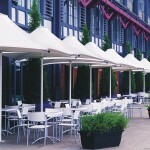 All Porta Architectural Umbrellas are available with a large base plate which allows movement from space to space, semi-permanent fixing into a pavement socket or permanent fixing to a fixed base plate. The Porta umbrella is not wind rated. 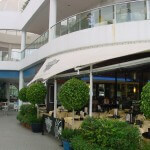 The Monaco (centre column, non-collapsible) is modular in design. The Monaco is square in plan and conical shape and ranges between 9.6-151.2sqm. 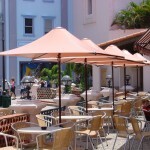 Monaco Architectural Umbrellas are site assembled, fixed, typically larger than the preassembled Centra, Leva and Porta Architectural Umbrellas and can be designed with linear (straight) edges and gutters. Multiple units can be linked together in one continuous membrane. Designed to Vdes 40.5m/s (145.8km/hr) as standard, an optional upgrade to Vdes 50.3m/s (181km/hr) or higher is available on Monaco models. All Monaco models include galvanised steel cables with stainless steel fittings, UV stabilized membrane, are delivered to site in component form. The Quasar (centre column, non-collapsible) is modular in design, square in plan and hyperbolic paraboloid shaped. Sizes range between 16-144sqm and multiple units can be linked together as one continuous membrane and can be designed with cantilevered columns. Designed to Vdes 40.5m/s (145.8km/hr) as standard, an optional upgrade to Vdes 50.3m/s (181km/hr) or higher is available on Quasar models.